Echoing the fantastic 1989 cookbook Manifold Destiny, which is about cooking food in engine compartments, a man has put whale-tail spoiler and hot engine together. 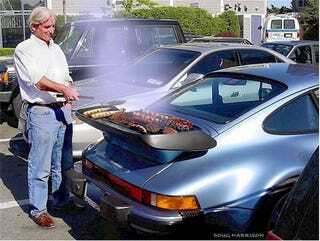 While the actual dietary habit of sperm whales (Physeter catodon) would lend itself to a riot of fresh grilled squid when combined with this whale-tail Porsche, the objects on this particular grill—almost wrote grille there!—appear to be nothing but various wursts, burgers and fish. Still, that stuff looks delicious, even if it eschews all pelagic jokes. And using the actual spoiler on a Porsche for cooking makes much more sense than delving deep into the car’s cramped engine compartment to find the actual manifold, as Manifold Destiny would probably suggest.